All this does is make me want an anime adaptation of this even more. Hm, the manga jumps right into the action; I wonder if they revisit the avatar creation with our favourite feline AI later. Also, wth is wrong with Nemesis' hand on page 6? Her little finger is as long as her index finger? @sam-pinansky oh how I wish there was an anime adaption of this. I haven't read the LN yet, but I guess I'll get started with the manga. The chapter's title is InfiniteDendrogram with no space in both places. Is that on purpose or an error? Page 18 ► It should be Liliana (no double N). Page 31 ► Empty bubble. Been wanting to read Imai Kami's adaptation of this series ever since it was announced. Thanks for bringing this!!! Definitely needs an anime adaptation. Also moar bear puns. I had to pick one between Arifureta and Dendro when they were on catch up in March. I picked Arifureta and have enjoyed it but I'll get into Dendro with the manga then. I've been following the webmanga for this in Japanese since it started releasing, super glad to see that it's getting an official English release. Huge fan of Kami Imai (Needless being one of my favourite manga of all time) and his art style fits Dendrogram perfectly, I cannot wait to see if catch up to some of the better moments in the LN because I just KNOW it's gonna be awesome. I might actually be enjoying it even more than the LN itself so far! So they're planning to destroy Altar. I want to read a couple of other LNs in my list first, but I'll probably get to Infinite Dendrogram LNs after that. V9 is coming out soon, too, if I remember right. 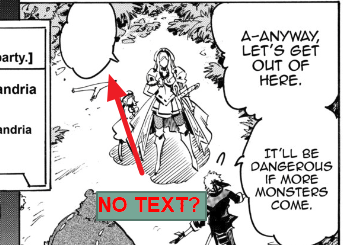 The font used for the UI related things(Quest text, status effects,etc) (in chapter 3) with the game and quest text seems a bit too bold in look? maybe use a font a little less fat? Its just my preference, but it looks ugly to me to be honest. The 2nd chapter uses a different font set for the UI/quest text/items and looks a lot better, for reference its on pages 12-13 of chapter 2. This is why I shouldn't post these things in advance. That was a powerful moment in the manga when Shu explained to Ray about the Altar/Dryfe War. In the LN, it was more read between the lines, but the manga made it clear just how guilty Shu felt about not participating in the war. Page 23 ► It should be 24 Hours (plural)? Or maybe 24-Hour (with a dash). @terabyte 24 hour is correct as it is referring to the length of the log in ban in that instance. 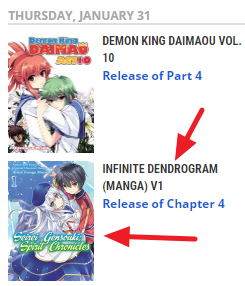 Since V1 part 1 had the cover of the volume on the front page, I’m wondering why V2 part 1 is missing the cover. The thread for Dendrogram vol 2 is five threads below this one. I created it a few days ago. V2 Pt 1 doesn't have the cover because I didn't add it to the usual chapter pages. I've fixed that. 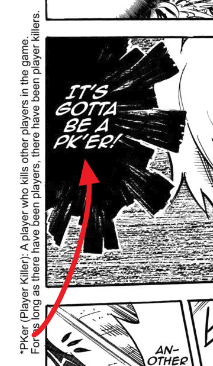 Vol 2 Ch 1 appears where it does because of a sorting glitch. That's fixed too.